Recently, a new diversity training, developed in collaboration with the Red Cross Los Angeles Region’s PrepareSoCal campaign, Los Angeles Region staff and Red Cross national headquarters, was launched nationwide—and is now being incorporated into training curriculums of disaster response operations. In March, Los Angeles based volunteer training facilitator Raini Hatchett delivered the training to new disaster responders in American Samoa. The diversity circle is one of the central components of the training that allows participants to learn what life experiences unite them as a group. Raini is one of our new “Harvey volunteers”. She joined the Red Cross in September, and quickly became engaged with Regional Volunteer Services and Workforce Engagement. Shortly after Hurricane Harvey, when our region received overwhelming interest from volunteers wanting to join the Red Cross, Raini began helping our teams onboard and deploy volunteers in the Los Angeles Region. She soon deployed herself, and upon her return, was promoted to a lead role in our Regional Workforce Engagement team. By the end of 2017, she had already deployed three times to support California Wildfire relief efforts. In November, upon return from deployment, she participated in a two-day Volunteer Services training workshop, where she first took our new Diversity Training. She was so impressed by the content, that she became a volunteer leadership and management training facilitator in the region, herself. 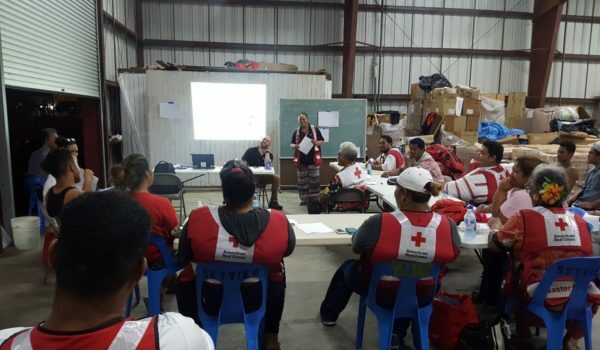 In March, she deployed for the fourth time – this time to American Samoa, where she was pulled into the Training Team and hosted a Diversity Training to new volunteers and other Red Crossers active in the disaster response. How amazing is that?! I was so happy to hear this news from her, as it shows how far we have come, and the direction we are moving to with the support of our regional and national leadership. It feels like such a short time ago, but it has already been a full year since the Diversity Training developed here in Los Angeles was launched nationwide. Last June, over 60 new facilitators were trained across the nation, and now the number of facilitators has already grown to several hundred. What a difference a year can make. Raini’s experience with the Red Cross proves the power of the Volunteer Services training curriculum and that the master trainer investment was well worth it! For volunteers like Raini, on-boarded after the launch of the Diversity Training, American Red Cross will always be identified as a place where diversity is acknowledged and celebrated!